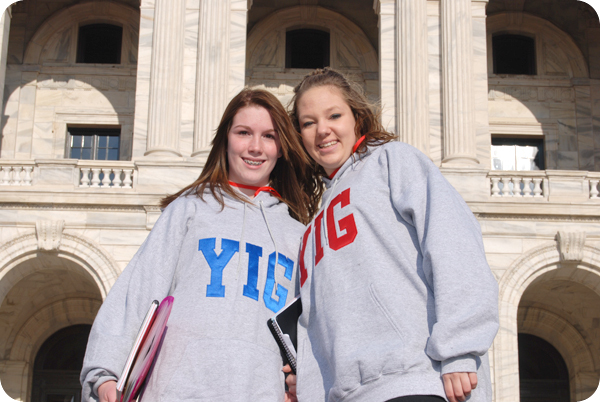 It is the mission of Minnesota YMCA Youth in Government programs to develop personal growth and encourage life-long, responsible citizenship by providing experiential learning for young people and by providing public forums to recognize the abilities and capabilities of youth. 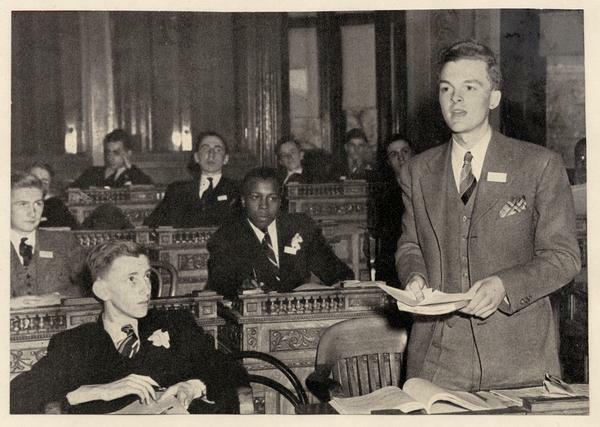 The first model legislature was held in Albany, New York. The first Model Assembly was held in Minnesota, held once every two years, and was comprised of the youth House and Senate and a Youth Governor. Youth in Government became an annual event. In addition to the writing and debating of bills, student legislators also contributed to a session newspaper, but the press corps was not yet a full program. In the late 1960s and early 1970s the program suffered from low enrollment which can be attributed to that era’s apathetic feelings toward government as a whole. The addition of the Page program in 1972 and a team of assistants to the Governor in 1973 helped to attract new participants. 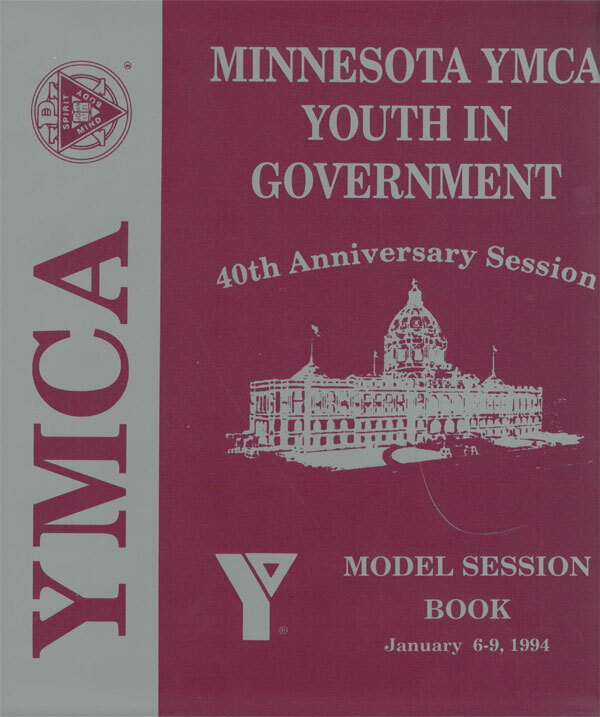 The Minnesota program office was moved to Rochester, Minnesota where the program was offered as a service to all YMCAs in Minnesota. Prior to this move, the Youth in Government program was run by the North Central Area Council of YMCAs. The YMCA of Metropolitan Minneapolis became the home for the program and has continued to offer the program on a state-wide basis. With the guidance of a State Board for Youth in Government, the YMCA hires appropriate staff that sees to the day to day operation of the programs. The State Board has traditionally been made up of prominent officials in state government and concerned individuals from the community. Youth in Government underwent one of its most important changes; adding the Youth in Law program, consisting solely of a model Supreme Court. The program was developed with the help of the late C. Donald Peterson, Associate Justice of the Minnesota Supreme Court. The first full Executive Cabinet program was instituted. The Attorney General’s office was added. An official Newspaper Press Corps was added. The Lobbyist program was offered, thanks to lobbyist and board member, Larry Harris. The position of Secretary of State was added to keep track of bills between the Legislature and Executive Branches. Minnesota Youth in Government began participating in the National Affairs Conference. Minnesota introduced its first Video Press Corps, modeled after similar programs that had been successful in other states. Youth Court of Appeals was created to respond the demand for participation in the Youth in Law program. This new court program was designed for 9th and 10th graders and coincided with the institution of an actual Court of Appeals in the Minnesota judicial system. The Freshman House came into being designed especially for 9th graders. This new program would both introduce first year legislative participants to the legislative system in a less intimidating setting as well as eliminate some of the stress on the House and Senate chambers caused by the growing numbers already in those legislative programs. Youth in Government participants began participating in Model Sessions in other states such as Alabama, Illinois, Michigan, North Carolina, Texas and Wisconsin. The first full time state director was hired. The first executive director was hired. The Freshman House was replaced by a two body legislature for 9th and 10th grade students. The Humphrey House (named after the late Hubert H. Humphrey, former U.S. Senator and Vice-President), and the Stassen Senate (named after Harold Stassen former Governor and signer of the United Nations Charter). The Humphrey House and Stassen Senate are housed in the hotel ballrooms and allowed the legislative programs to reduce their sizes to the actual numbers of 67 Senators and 134 House members. YIG Radio Station aired its first broadcast, operating early mornings, late afternoons and all night to entertain students when they are in their hotel rooms after hours. The Sibley House and Ramsey Senate were added due to increasing program enrollment. Named for Henry Sibley, first State Governor, and Alexander Ramsey, first Territorial Governor, the Sibley House and Ramsey Senate also serve 9th and 10th grade participants. In order to better serve the interests of the delegates and to expand participants in the government process, the Cabinet and Lobbyist programs underwent a division into Junior and Senior departments which are better-equipped to exert their influences on the legislative agenda. A similar phenomenon began in the Court of Appeals in the mid 1990s; with the advent of a one-day Trial Court model to enhance the appellate process for all judicial participants. Boot Camp, a leadership training experiences for smaller groups was added. A formal and full-time conference newspaper was added to the Model United Nations program. The functions of the youth-run State Steering Committee and Boot Camp were combined into a State Steering Committee Retreat, with required attendance from all Model Assembly delegations in the state. Youth in Government conducts several training sessions of Officers and Appointed Officials of the Model Assembly, Model United Nations and National Affairs delegation, in addition to the Steering Committee retreat. These training sessions and retreats focus on the job responsibilities of program officers; to expand the horizons of youth leaders on responsible use of authority, power and responsibility. The Leadership Corps program area replaced the Page program and focuses 8th grade students’ experience on leadership development and issues exploration – helping students think about the topics that affect them, their families and their communities.